– B.A. Political Science and Economics, Bachelor of Library Science (1953), Masters of Library Science (1956); M.A. Political Science (1963) University of Toronto. – University of Toronto Library: Joined as a cataloguer 1955-1956, later returning as Assistant Chief Librarian 1959-1963, and Associate Librarian 1963. – General editor, Directory of Associations in Canada : 1974-1997.
city possessing multiple degrees and a keen interest in forces that shape a community: politics, economics and business. He joined the Windsor Public Library at a time when the system was growing and beginning to offer specialized subject services from the Carnegie Branch. Mr. Land developed the Business and Industry collection and was instrumental in securing for the Windsor Public Library the automatic receipt of public documents from both the federal and provincial governments. He recognized that research and statistics produced by senior governments were valuable to building businesses, as well as assisting local officials develop policies and programs. After leaving the Windsor Public Library, Mr. Land returned to Toronto to be an administrator with the University of Toronto Library, later becoming a professor and then Dean of the library school at the university. He continued as a part time instructor of future librarians after his 1978 appointment as the Executive Director for the Ontario Legislative Library, a position he held until he retired in 1993. Brian Land was active in many professional associations, and wrote numerous journal articles. From 1974 to 1997 he was the general editor for The Directory of Associations in Canada. In retirement, genealogy and Canadian history were his passions. Brian Land died, aged 89, in 2016. 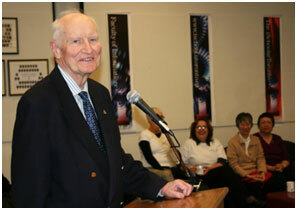 “iSchool’s first Dean, Brian Land, passes away“. University of Toronto. Faculty of Information. “News”. November 29, 2016. [website] URL: . Accessed January 3, 2017. “Land, Reginald Brian“. Globe and Mail. Deaths. (November 30, 2016). Online edition. Windsor Public Libraries. Annual report. 1956. “Annual report. Carnegie Library” by Gladys Shepley.